Maxthon 1.0.3, a browser made in China that has made it to the U.S. and the Mac, is a blisteringly fast, undeniably slick way to navigate the web. It’s also Google Chrome—well, mostly Google Chrome, or at least its open-source sibling Chromium. Nods to Mozilla, WebKit, Darwin, and seemingly every other open-source browser framework also show up in the program’s documentation. Your Roots Are Showing: Maxthon doesn’t try too hard to disguise the great chunks of its code that come from Google’s Chromium. 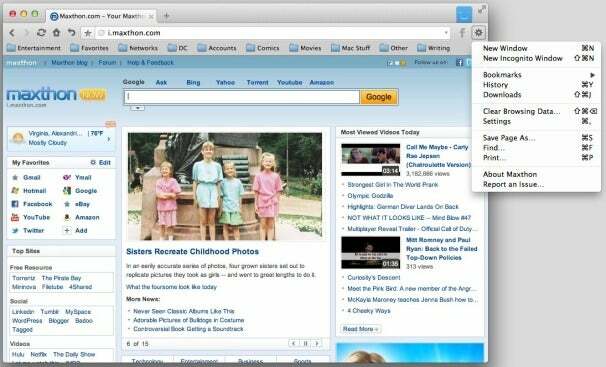 Everything you know from Chrome (and a lot you’ll find in Safari 6 ( ) is here in Maxthon, including a handy unified search/URL bar, tabbed browsing, the exact same developer tools, and an options menu at the top right of the window. Maxthon has its own My Maxthon synching system for bookmarks and passwords, though you’ll need to hand over an email address to sign up. So why should you even bother with a browser that’s basically Chrome with a facelift? Maxthon offers several reasons, but not all of them are equally compelling. Maxthon promises a fast browsing experience, and on this count, it absolutely delivers. HTML text on pages renders in less time than it takes to blink, and images and other features appear as quickly as your connection will allow. Full support for OS X gesture controls lets you scroll and swipe through the web with impressive grace. I don’t know whether I’ve used a Mac browser that feels faster than Maxthon. Maxthon also tries to bring in the Reader feature from Safari, turning multi-page articles into a single coherent reading experience. Alas, here this feature is somehow even more broken than it was when it first appeared in Safari 5—no mean feat. I couldn’t get Maxthon’s Reader to load more than the first page of any article; in some cases where it should have appeared, the option to turn it on didn’t show up at all. Many of the more elaborate features in the PC version of Maxthon haven’t yet arrived on the Mac, but it does handle the basics more than competently. I had no trouble with Netflix streaming, QuickTime movies, or any other usual browsing task. Perhaps thanks to its Chromium code, Maxthon worked beautifully with WebGL 3D demos. And it implements an Opera- and Safari-style grid of popular sites in new tabs far better than the latest version of Firefox. 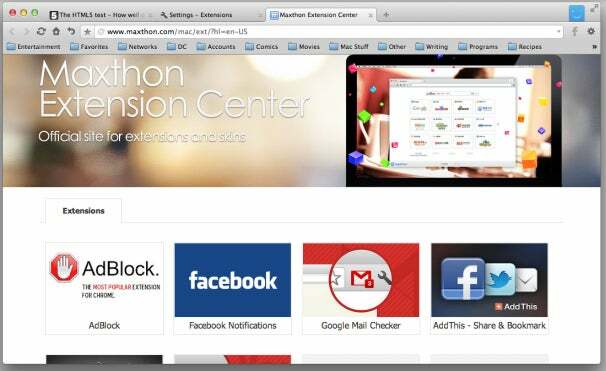 Extensions: Some of the Maxthon extensions seem entirely borrowed from Chrome. In benchmark tests on a 2GHz aluminum MacBook with 2GB of RAM, Maxthon performed quite respectably in some tests, but lagged curiously in others, especially in several tests where Chrome smoked the competition. Maxthon’s PC version posts one of HTML5Test.com’s highest scores for compliance with the latest Web standards. But the Mac version—at least on my Mac—beat only Firefox, trailing Safari and Opera ( ), and left far in the dust by Chrome. It did, however, ace the Acid3 standards test, like every browser save Firefox. Maxthon beat all comers in HTML5 bitmap graphics performance, edging out Opera and Safari. (This may explain its superb speed when loading pages.) 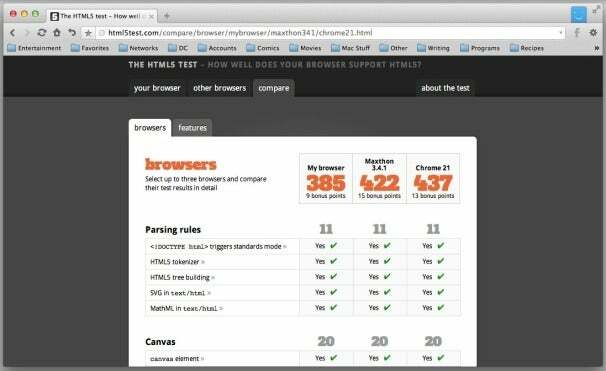 However, it placed dead last for HTML5 text handling, and came in fourth out of five browsers in HTML5 vector graphics. Its score there roughly equaled Chrome’s, but came in at around half of Safari’s results. Maxthon’s perfectly fine for anything you’d want to do on the Web, and it definitely feels at least a bit faster than any other browser. But its rough edges and clear debts to other browsers make it feel more like a hastily assembled knockoff than a bold new challenger. It has the potential to be a terrific browser, but for now, it’s clearly—and somewhat shakily— standing on the shoulders of giants.